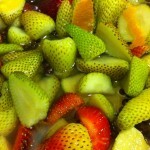 When you think of preserving sweet fruits like strawberries, The most obvious is, well, preserves. Since that does not involve fermentation, that was a non-starter. WINE! I once watched Sandor Katz make a country wine from strawberries during my stay at his residency program, so that was the next idea. 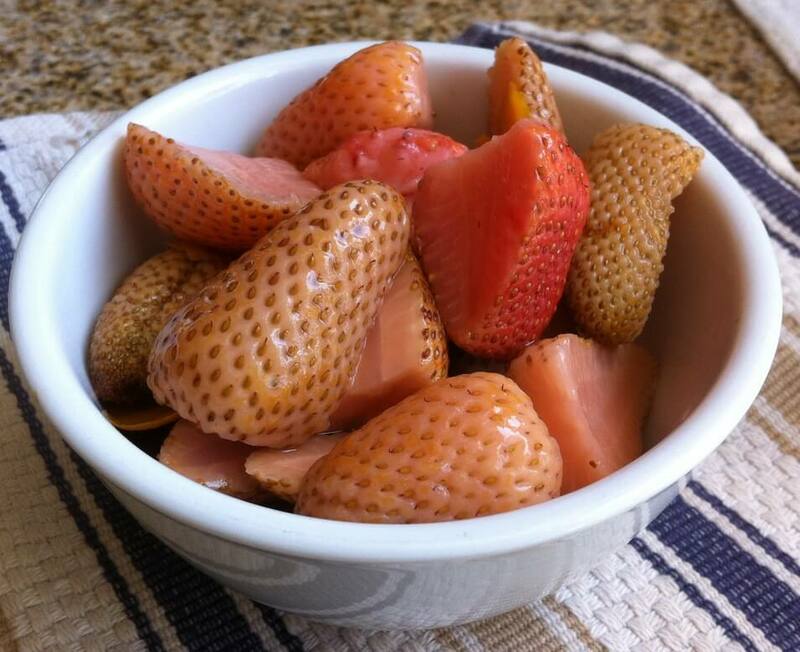 Lactic acid fermentation of fruits like strawberries is difficult, due to their high sugar content (which tends to ferment into alcohol) and because of their naturally high acidity (pH around 3). 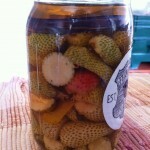 Now you can make a fast fruit chutney and achieve lactic acid fermentation. But green strawberries have more starch and less sugar content than their ripe counterparts. Culinarily speaking, they can be treated more like cucumbers or other vegetables. I found some “quick-pickled” recipes (made with vinegar) to get some inspiration on the spices, but tried brining them instead. 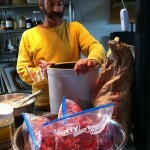 We did manage to get ripe berries into a strawberry sauerkraut by dehydrating them first. 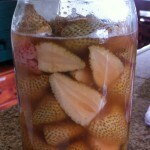 Green strawberries soften during fermentation. 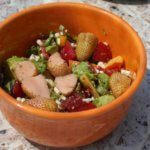 They have a lot of crunch, like a cucumber, with just an essence of berries. Dilute salt into water to make brine. 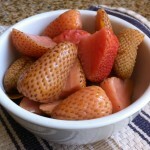 Remove leafy tops from strawberries and slice in half lengthwise. You can leave the berries that are smaller than your thumb whole. Rinse berries well. 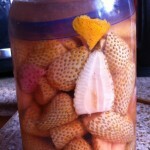 Add orange peel, bay leaves, allspice and apple cider vinegar or kombucha to 1 quart sized mason jar. If using jalapeño, cut top off. To reduce heat of pepper, remove the seeds and white membrane and discard or compost. Leave them in if you want it really spicy! Slice lengthwise into quarters. Add slices to jar. Add strawberries to jar. Use your Tetris skills to ensure they all fit! 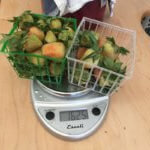 Insert a weight to keep the strawberries submerged in the brine. Slowly pour brine in, coming to ½" below the top of the jar. Close the lid tightly (or use airlock) and set on kitchen counter. After 2 days (if not using airlock), "burp" the jar to release pressure and observe fermentation activity (bubbles will tell you it's happening). Ferment another 2-4 days, burping daily. The strawberries will soften further. When the strawberries have softened to your liking (could take up to 10 days or more), remove weight and store in refrigerator. They will last 1-2 months in refrigerator before starting to get mushy. How to serve them? They go well with a creamy mild cheese (think Brie or Camembert), in tacos, on a cheese or charcuterie plate, sliced on a sandwich, atop a green salad, as a cocktail garnish, or simply stirred into some kefir, yogurt or porridge. Anywhere when you’d use sweet and sour pickles or even mild pickled peppers, you can use these beauties. How would you use them, Fermenters? Add your comments below! Day 9, softening up. Notice some carbonation.